Scare up some fun this Halloween with our great selection of Halloween candles. Candles are the perfect way to haunt your house and spook your party guests. These Halloween Candles come in two shapes, sizes and scents. spider web candle set Spider web candles are creepy enough, but this pair really scares. Decorating doesn't get any spookier than this! Set of 2 taper candles and 2 candle holders. bat sugar candles - set of 6 These bat votives mesmerize Halloween guests, catching and bouncing light off of their granular surfaces. 3" tall by 2.5" wide. Set of 6.
sugar coated dot votives - set of 6 These textured glass candleholders feature a funky polka dot pattern. Get a few and arrange them in clusters or scatter them around the room. The black, orange, white and green color palette easily complements a variety of decorating schemes, Halloween in particular. 3" tall by 2.5" diameter. Set of 6. 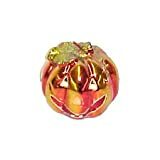 Frosted 6-Pc Pumpkin Set - 6-Pc Set This Frosted 6-Pc Pumpkin Set is perfect for either fall or halloween and is adorned with tiny beads to give it that sparkly frosted look. Comes pumpkin spice scented and nicely packaged perfect for gift giving. Samhain Sabbat Celebration Pillar Candle Celebrate the mysteries of Samhain with the Sacred Mists Samhain Sabbat Celebration Candle! Deep, rich pumpkin colored wax is hand poured and triple-scented in small batches using an ancient blend of pure, magickal resins and oils including exotic Dragon's Blood and sweet Amber. Absolutely magickal! On the back you will find Doreen Valiente's (1922-1999) "Samhain Chant", bringing powerful symbolism of honoring those who have crossed before us and welcoming our ancestors into our space as the wheel turns and the veil grows thin. 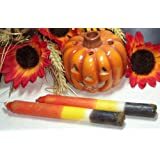 Jack-O-Lantern Candles (24/disp) Jack-o-lantern candles come in a variety of festive Halloween colors. 24 per display. 2". Black Grande Classic Nothing beats basic, classic black! 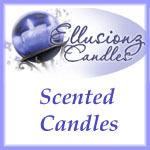 This is an unscented or fragrance free candle. Black Classic Nothing beats basic, classic black! This is an unscented or fragrance free candle. Black Handipt Nothing beats basic, classic black! Coordinates with Serenity scent. Floating Mini Ghost Candles (set of 20) One of our favorites! Our floating mini ghost candles can be used as floating candles, unlit as table scatter or for decorating cakes, pastries, or cupcakes. Burn time is 50 mins each. Set includes 20 candles. 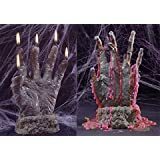 Halloween MonsterBash Candles (set of 4) These frightful Halloween MonsterBash Candles (set of 4) are delightful for Halloween. Each wonderfully shaped and richly colored pumpkin candle is painted with a spooky monster face. They are excellent as table decorations. Comes in a set of 4 pumpkin candles. Each candle burns for approximately 10 hours. Flying Bat Candles on a String (set of 6) Get creative with our Flying Bat Candles on a String (set of 6). This set of 6 bat-shaped candles is strung together on an extra long cotton wick. They can be used uncut or cut. Each candle offers 2 hours of burn time. Halloween "Boo!" Inlaid Pillar Candles Get into the spirit of happy haunting and trick-or-treating with our Halloween "Boo!" Inlaid Pillar Candles. These candles give off a soft spiced Pumpkin Scent. The candles have "Boo!" inlaid on the exterior and they are accented with ghost faces within the "O" in "BOO!" Available in different sizes. Each sold separately. 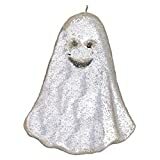 Include the Halloween Dancing Ghost Pillar Candleholder to complete the look! Avant Bats Votives (set of 4) Have a frightful Halloween celebration with our Avant Bats Votive Set (set of 4). These frosted votives are flocked with fuzzy bats to set an eerie mood for your Halloween bash. A great addition to bring to your haunted house! 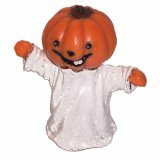 Also check out other Halloween items for a complete presentation. Halloween "Boo!" Inlaid Pillar Candle Get into the spirit of happy haunting and trick-or-treating with our Halloween "Boo!" Inlaid Pillar Candles. These candles give off a soft spiced Pumpkin Scent. The candles have "Boo!" inlaid on the exterior and they are accented with ghost faces within the "O" in "BOO!" Available in different sizes. Each sold separately. Include the Halloween Dancing Ghost Pillar Candleholder to complete the look! We are proud to announce a new candlemaker that has created these wonderful sabbat candles for us! These are a little larger than our traditional sabbat candles as well! They are beautifully colored in black, white and orange. The sweet scent will remind you of trick or treating! They will fit any standard candle taper holder and will add old world charm and beauty to your Samhain Altar and celebration! Bleeding Skull Molded Candle Perfect for a ghoulish table decoration! This skull candle "bleeds" red wax to add some macabre ambiance to your table. Approximately 4.5" tall x 4.25" wide. Glowing Molded Eyeball Candle Includes one (1) candle. Approximately 4" wide x 3" tall. Gourd and Pumpkin Filled Candleholders This Fall, for your Halloween or Thanksgiving décor, let these ceramic Gourd and Pumpkin Filled Candle Holders spice up your room. Each candle holder is filled with ivory wax and has a burn time of about two hours. Once the candle is burned out, simply replace them with tealights. Select from Gourd (green) and Pumpkin (orange). 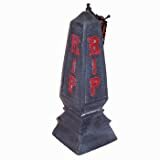 Grim Reaper Creepy Halloween Candles (B453-4) Grim Reaper Creepy Candles - Torturous taper candles. Set of two black-robed skeletal reapers holding sickles. 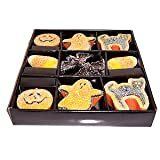 Halloween Tea Light Set Whimsical tea light candles include 6 assorted Halloween characters per set; 6 sets per pack. 2"H with metal cups.